One DiGiCo SD7 Console with two Waves I/Os for DiGiCo SD Consoles, one on each engine. Both engines must be SD version V987 or above. Four SoundGrid Servers to process plugins, we highly recommend they all be of the same model and generation. Eleven SoundGrid compatible Ethernet cables at supported lengths (you should always have a few extras with you). Nine cables if you choose to use only two servers. Download Waves Central and follow installer steps to install. Under "1. Install from" Select "Online"
Under "2. Choose Products to Install" select "All Waves Products". Search for the following, selecting each result so it appears under "3. Selected Products"
Waves bundle/s or plugins you own licenses for and wish to install and activate on this setup. Note you should have a second set of licenses available to install and activate on Computer B. Select licenses for MultiRack and for your bundle/s or plugins in your Cloud and send to the host computer or to a USB key. Repeat on Computer B! Versions of MultiRack and plugins must be the same on both MultiRack systems. Mark all your hardware and cables! Associate switches and servers to Engines A or B. Do not connect an ethernet cable between Switches A and B for now! Under Enable External MultiRack click YES and make sure the NIC of the console is chosen as Waves network. 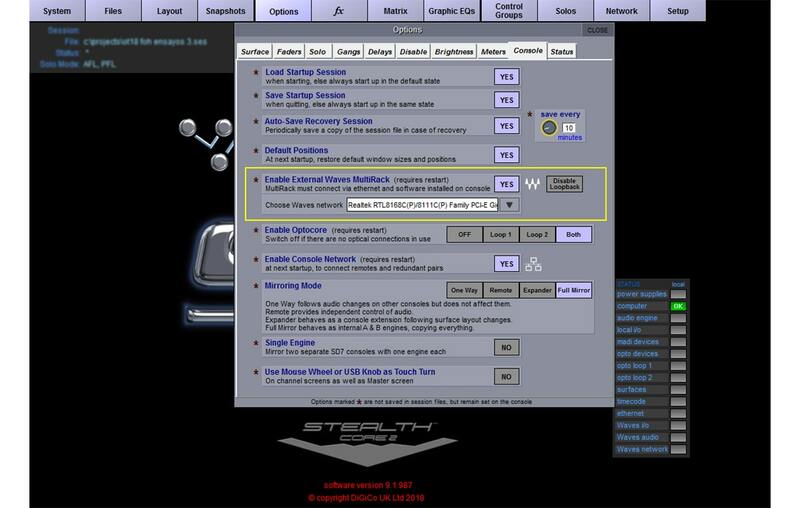 Go to MultiRack>Preferences>General Tab and choose the host computer’s LAN port that is used for SoundGrid. 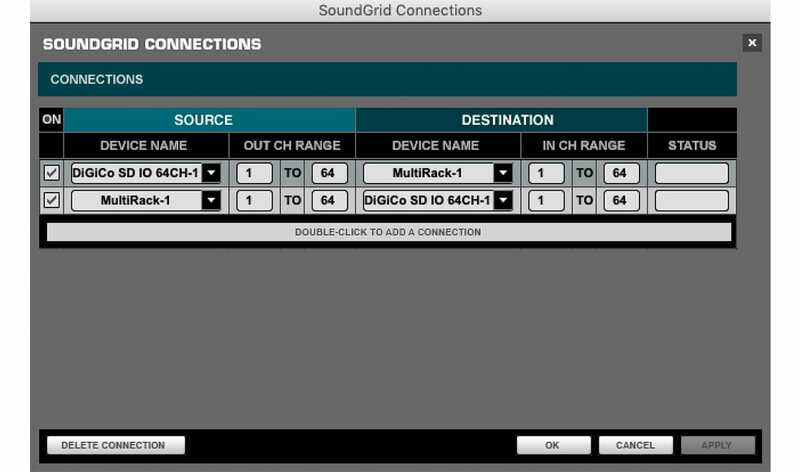 When a valid SoundGrid port is recognized, there will be a prompt stating: “SoundGrid Network Found"
Go to MultiRack>Preferences>Remote Control tab and choose the same LAN port used for SoundGrid, Assign to “1”. 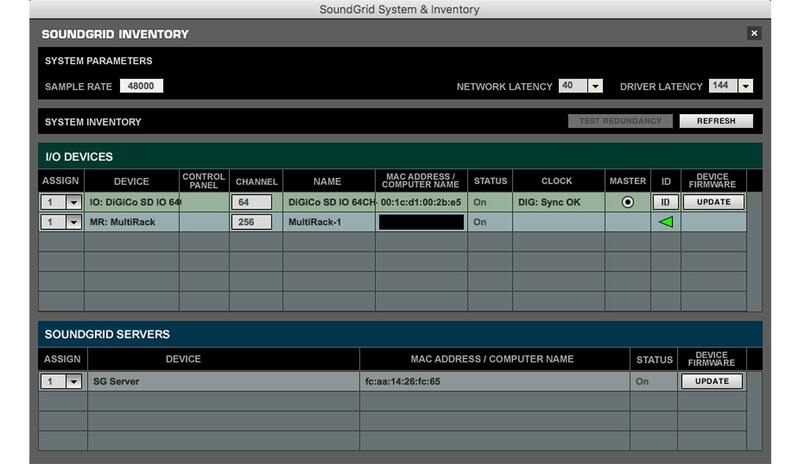 SoundGrid Inventory Page (F2): Use the MultiRack Inventory page to assign I/Os and servers to the SoundGrid network. SoundGrid Connections Page (F3): Open the SoundGrid Connections page to establish the link between the console’s I/O and MultiRack. Patch in both directions: MultiRack to console and console to MultiRack. Once a connection has been established, the Remote (RMT) LED on the Top Bar will be black with orange letters. MultiRack will display an alert if it encounters synchronization problems. Repeat steps a-f on Computer B! Each engine now has its own complete, synchronized MultiRack system as set up above. These are separate systems, but communicate via the SoundGrid network. Set up SD7 engine mirroring per DiGiCo instructions (Page 1-10 in the SD7 manual). Mirror To > engines sync and MultiRacks are now fully mirrored. Witness any action done on Engine / MultiRack A reflected on Engine / MultiRack B and vice versa. 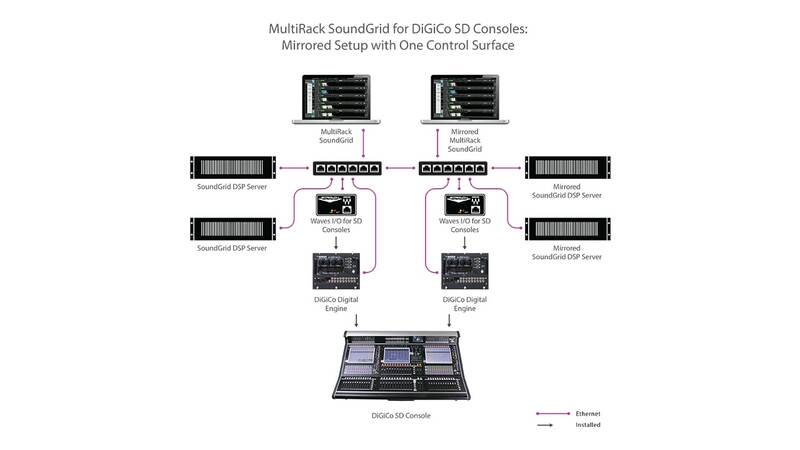 In the event of a failure, MultiRack SoundGrid control and processing will pass to the mirrored DiGiCo engine and MultiRack setup. Switching between engines is handled by the console’s Engine A / Engine B Control. Sessions are saved on the MultiRack computer and are loaded when the console sends a request. If a session with the same name already exists in the Integrated Sessions folder on the MultiRack computer, that session will load. If a file of the same name is not present on the MultiRack computer, an empty session will be created but it won’t be saved. You will need to save the session again from the console so that a session with the same name will be saved on the computer as well. Synchronized session files are saved on the MultiRack host and the console. An “SES” file is saved to the console computer: (D:\Projects). An “.mrdb” file is saved on the MultiRack computer.